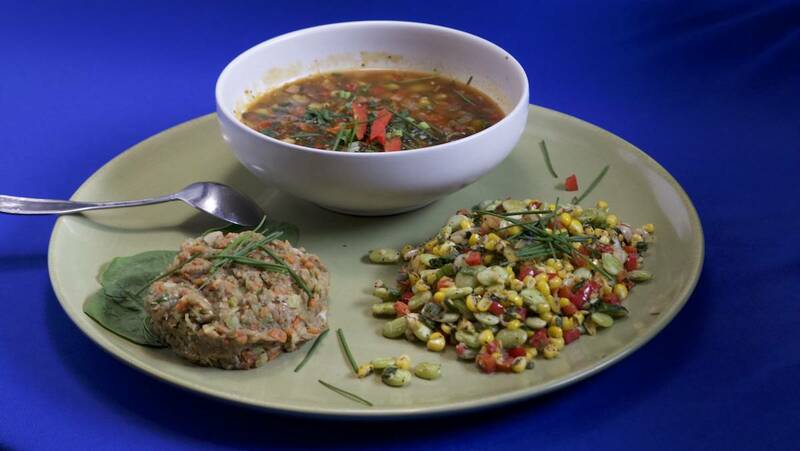 Chef Rob Stinson cooks Butter Bean soup with ham, seared butter bean salad. We travel to Oxford MS to Visit the Little Carrots Kids camp. Our guest is Keri Horn, Rebecca Turner talks about kid’s lunches on our nutrition segment. Soak butter beans (fresh) or drain (canned). Spray pot with zero fat and sear garlic, ham, onion, red bell pepper with black pepper. Add beans and toss well in hot pan. Add cornstarch to pan and slowly, while stirring with a wisk add stock and parsley. Garnish with green onion and serve. Heat pan with oil. Place garlic, carrots, onions and butter beans in pan. Sear well and remove from heat and mix together with all other ingredients. Place in blender and puree well. Hold for plating.